Superintendent Mark Johnson (left) and State Board of Education Chairman Bill Cobey (right). Bill Cobey, the longtime North Carolina Republican who’s clashed of late with members of his own party in the N.C. General Assembly and Superintendent Mark Johnson, will not seek another term as board chair when his term ends in September. Asked whether he intends to remain on the board for the duration of his term, which ends next March, Cobey declined to comment. The former chair of the state Republican party and, at one time, a GOP hopeful for governor, Cobey has a long history in North Carolina politics and leadership. He served one term as a member of the U.S. House of Representatives, sat as athletic director for UNC-Chapel Hill, and directed former GOP presidential candidate Mike Huckabee’s campaign in North Carolina. But in recent years, Cobey—who was appointed to the State Board of Education by former Gov. Pat McCrory in 2013—has often been at odds with the public education decisions of the Republican-controlled legislature and the state superintendent. Johnson and members of the board battled in court this year over sweeping new powers given to the GOP superintendent by the legislature last year, with both sides, bizarrely, claiming victory in a state Supreme Court decision in June. The decision seemed to confirm Johnson’s new powers. Cobey says the state board is now prepping new rules that “define our relationship with the superintendent,” even as Johnson’s office took swipes at the board chair in a terse statement last month. The shakeup in board leadership will come at a tumultuous time for the board, which has long led the state’s K-12 system with the superintendent. The board’s former vice chair, A.L. “Buddy” Collins stepped down in March to focus on his campaign for a local county commission seat in Forsyth County. Board member Eric Davis, who has also clashed with Johnson and state legislators, became vice chair in Collins’ stead. It’s unclear who will step into Cobey’s role as chairman after his departure. Meanwhile, state lawmakers rankled some when they voted down two of Gov. Roy Cooper’s long-pending nominations for expired state board seats last month. Legislators re-confirmed current board member Reginald Kenan, but voted down confirmation for J.B. Buxton, a former education adviser for ex-Gov. Mike Easley, and Sandra Byrd, a retired UNC-Asheville associate professor and provost. 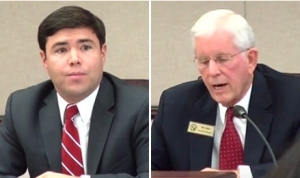 Lawmakers provided no reasoning in denying a seat for Buxton. The legislature has allowed the Democratic governor’s state board nominations to bog down for months, while two members, Tricia Willoughby and Wayne McDevitt, continue to serve in seats that expired in March 2017. Cobey said he’s tried to stay out of the confirmation controversy.